Hong Kong's gap between rich and poor Jump to media player Chinese President Hu Jintao has arrived in Hong Kong to celebrate the 15th anniversary of the city's return to China, but he faces a noisy, unhappy public and an increasingly tense political climate. 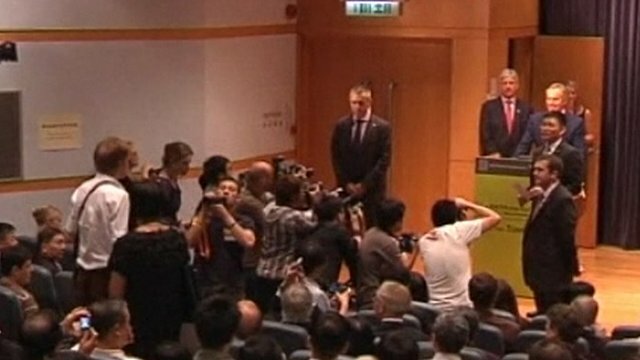 Ex-PM Blair heckled in Hong Kong Jump to media player A heckler interrupted former British Prime Minister Tony Blair as began a speech on religion and globalisation at the University of Hong Kong. How much can you fit in 32m sq? Jump to media player Hong Kong architect Gary Change has redesigned his the 32m sq apartment he grew up in, to make the most of his limited space and include all mod cons, and luxuries. Chinese President Hu Jintao has arrived in Hong Kong to celebrate the 15th anniversary of the city's return to China, but he faces a noisy, unhappy public and an increasingly tense political climate. Integration with the mainland has brought Hong Kong much success as a global financial centre but it has also created problems. Those problems seem to be at their worst at any time since the handover, according to a series of surveys and opinion polls. One independent poll shows the Hong Kong public's mistrust of the Chinese government stands at a post-handover high, largely because of a number of political scandals. The BBC's Hong Kong correspondent Juliana Liu reports.